This blog series has been dedicated to introducing you to the concept of Stewardship. Stewardship takes on many forms: time, family, faith, talent, prayer and, finally, treasure. In the last post, I described stewardship as it relates to prayer. 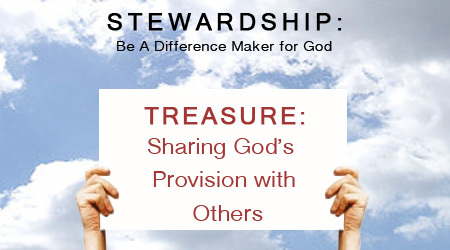 In this post, I would like to introduce you to the concept of Stewardship as it relates to treasure. Most people don’t like to talk about money. I remember my parents squirming in the pews when I was a kid as the priest talked about needing to extend an existing building. Not quite what they wanted to hear! But over the past several years and, especially shortly after my mom died four years ago, I have received greater revelation of what my perspective is as it relates to the Stewardship of treasure. This revelation is not really all that complicated. It’s simply that none of our stuff is ours — it belongs to God. Once you get that, the rest is peripheral! After my mom passed, I felt a strong sense of her presence in spirit, her warm embrace and her guiding heart. When my father was liquidating her earthly treasures, I respectfully declined taking anything. Nothing really meant anything to me. It was her spirit, her life song, her memory that I cherished. I think that’s all God cares about. He cares about our devotion to Him, our release of earthly treasure, and our focus on HIM. Over the past few years, my leanings toward materialism have declined considerably and I find myself much happier. Don’t get me wrong — I still like my iPhone and I’m tapping away on my MacBook right now, but I consider these tools, not treasures. With this concept in hand, that God owns everything and none of it is ours, I don’t feel so compelled to die after having accumulated the most I can. I want to die doing the most for HIM, not myself. This does not mean that prosperity is bad, that wealth is dirty—remember it is not money that is the root of all evil, but the love of money. It also does not mean that success should be shunned. It just means that, if it occurs, it is an outcome, not the goal. I do believe it is Biblical to tithe. I also believe a joyful giver is a joyful recipient of all that God has to offer. I could go into all the Biblical references that support tithing, but I am sure that there are some who could show what they believe to be Biblical facts against it. As for me, I support it. I have been blessed to have heard a message from the pastor, David Ashcraft, at my church home LCBC, who describes the 10-10-80 plan. David explains that a great way to manage your finances is to tithe 10%, save 10% and spend 80% on your living expenses. It makes much sense and is especially easy to remember and follow. This wraps up this series and this posting. We would love to hear your comments on Stewardship of Treasure. This is always a topic that sparks a lot of interest and debate. The community values all opinions.